Alis’ House is a typical Khmer residence in Siem Reap Cambodia, that has been converted to a homestay featuring a few dormitory beds and several private rooms. Two rooms have up to 6 dorm beds and are air conditioned. Each bed has its own reading light, power outlet, and security locker. Each room has its own bathroom equipped with a toilet, wash basin, mirror, and hot shower. Both rooms are co-ed. We provide the linens and towels. All of our dormitory beds are full beds measuring 1m x 2m. One of these dormitories is a whole-dorm room. This is a regular dormitory room with a bathroom and air conditioning and six individual beds (bunk beds) for your exclusive use. This has been very popular with families traveling together and small groups of friends traveling together. We also have a few private rooms with a double bed and bathroom (featured above). These “family” rooms are ideal for couples or small families who want to stay in the same room. Located just a few minutes from Angkor Park to the north, and Downtown/Pub Street to the south, Alis’ House is close to all the action but just far enough away to provide for a peaceful night’s sleep. Cold water, chilled soft drinks, and beer are available for purchase at the reception desk. 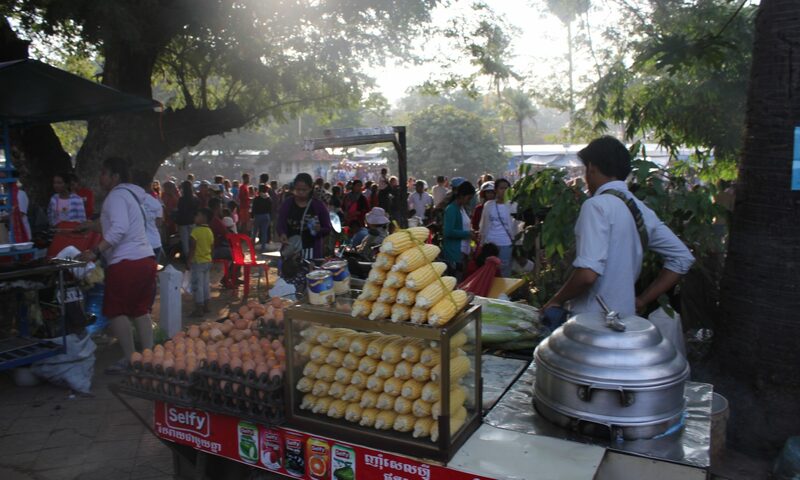 Many choices of food are readily available within 50 meters of the house. Two outdoor covered patios are available for friends to relax and make plans for their next day. We provide free Wi-Fi access to our guests. We also have a computer that can be used to check your email and perform quick searches. We have an arrangement with a local hotel for swimming pool usage. The hotel will allow our guests free use of their pool if the guests purchase something from their bar/restaurant. We can arrange motorbike and bicycle rentals for you and we excel in helping you plan your touring activities in Angkor Archaeological Park. To book our property, please use our contact form to receive the best rates. We accept cash only on site in either US dollars or Khmer Riel. We also work with local tour guides and travel agencies. Our booking partners Air BNB and Agoda accept many payment types including credit cards. You can find our links in the sidebar on this page. Please check our reviews on Facebook, Booking.com, and Google to learn how we have typically exceeded our guests expectations for the low prices we charge. Obviously we speak English. For everything else we use Google Translate. (28 September 2018) We are fortunate to have had some wonderful guests earlier this year who are bloggers. They documented their visit to Cambodia and featured Alis’ House in their blog, BUILDER’S JOURNAL. Thank you Edmar for your coverage and I hope your travels will bring you back to visit again in the future. (3 May 2018) Alis’ House is featured in The Broke Backpacker as one of their 23 recommended hostels. Thank you Aaron! The Broke Backpacker has comprehensive coverage of Siem Reap and Angkor Archaeological Park. Aaron has done a good job explaining Khmer culture and his blog is worth the read. (1 May 2018) In response to customer suggestions on how to improve the guest experience, we moved opening our kitchen to the top of the list and made obtaining basic appliances and kitchenware a priority. We are happy to announce that the kitchen is now open! Guests may use the appliances to prepare snacks and meals. We even stock the cupboard with some ramen noodles for purchase for the convenience of our guests. At Alis’ House we offer three types of room accommodations: dormitory style rooms at a very economical nightly rate, family style rooms at a higher rate reflecting the private use of a whole room, and our new addition of a family suite with two separate bedrooms. We have two styles of bathrooms. Guest rooms are all connected with a bathroom for that room. Additionally, we have built a bathroom addition to the house for use by our guests staying in the dormitories so that multiple guests in the rooms can get ready at the same time. We have several common areas on the property. The patio in the reception area boasts casual seating and a small garden. We have an outdoor patio upstairs suitable for a small group gathering. Inside the house is a lounge where guests might relax, play games, or make plans for the next day with their travel companions. We have a small area in front for parking motorbikes and scooters. A Bed in the Mixed Dormitory Room is $6.50 USD/night. During holidays and special events, the rates may be higher. The Family/Double Room is $18.00 USD/night, including air conditioning. During holidays and special events, the rates may be higher. There is an additional charge for more than two adults to stay in the room. The Whole Dorm Room (6 beds + bathroom + air conditioning) is $34.00 USD/night. We have had a number of young adults traveling together and some families with children who found this choice to be perfect for their needs. Our NEW Family Suite (2 bedrooms, 1 double bed and 2 twin beds) is available at $35 USD/night. The suite sleeps 4 adults comfortably and has an extra sink in the bathroom. Both rooms have their own air conditioners. We can offer a discount in our Double Rooms and our Whole Dorm Room if you elect to use a fan instead of the air conditioner. Please contact us if your booking needs are unique and we will do our best to meet your needs. This business accepts cash only on premises. We are not set up to accept other forms of payment. (Cambodia residents can use True Money or Wing, foreigners can use Western Union money transfer service). Those wishing to use a credit card are encouraged to book with one of our booking partners who accepts that form of payment. Some reservations will require a deposit. We typically accept deposits through Western Union Money Transfer. Within Cambodia we also accept True Money and Wing money transfers. When a deposit is required, it is non-refundable. A reservation committing a substantial portion of our property (rooms or length of stay) and bookings from countries that have a high fraud rate, will be required to make a deposit prior to confirmation of the reservation if they have not prepaid. The amount is determined as the greater of the rate for one night or 20% of the total. In the case where a reservation is made through one of our booking partners and the guest has prepaid, the booking partner’s refund policy will be in effect. During Cambodian holiday periods, we request a 50% deposit. In Cambodia, tipping is not expected to receive good service. We note that many of our guests still prefer to offer tips as a gesture of their appreciation for the care they received while staying with us. It takes a team working together to provide a rewarding guest experience. Our policy is to pool tips and divide them among our staff based on the number of hours worked. Our new Family Suite has two separate bedrooms, each equipped with an air conditioning unit. Perfect for small families traveling together. The suite sleeps 4 adults comfortably. The ensuite (attached bathroom) has a separate powder room with sink, separate from the shower, toilet, and sink combination, allowing for efficient sharing of the facilities for the family. Alis’ House has two rooms that are double rooms. These are very similar to the rooms found in the larger hotels but for a fraction of the price. The rooms have a large, double bed where two adults can sleep comfortably. There is also a bed-side table. To add to your comfort, family rooms are air conditioned at no extra charge. The Family rooms are often used by couples traveling together who would like their own space. It is also common that Khmer families traveling together will want to share a large room together. Each Family room has its own private bathroom. Please read more about our bathrooms. We provide each room with a reading light, clean linens, two pillows, multiple 220 volt power receptacles, and a towel for each guest. The rooms include free Wi-Fi, allowing the guest to comfortably keep in touch with their friends and family while they stay with us. The beds and pillows are comfortable, helping you to sleep well in your air conditioned room. Click here to continue reading about the bathrooms. If you have stayed with us, please leave your comments. Comments are reviewed before displaying. You can also find guest reviews on our Facebook page. We had a special couple stay with us once in September and then came back to spend time with us in October. Their review is on our Facebook page. One source of information is the Centers for Disease Control in the United States. Please consult your own medical provider before you travel. Cambodia has mosquitoes and guests should be prepared to protect themselves against mosquito bites. Mosquito repellent is available for purchase in Siem Reap, however, guests may prefer to bring a product they are familiar with.